Interact with the data, using analysis options similar to those found in an Excel® workbook, without any connection to a server. Analysis options include filtering, sorting, charting, and much more. Save the report on a local machine with active report functionality. Since no connection to a server is required to view the data or use the analysis options, you can save and use the report anywhere. Performance may vary across browsers due to browser-specific memory limitations. For very large reports, Internet Explorer® may produce an error. For more information, refer to the Microsoft® website. An active report for Adobe Flash Player includes most of the capabilities available in the HTML version of active reports in a visually enhanced, user-friendly report format. An active report delivered as a self-contained Adobe Flash SWF file that is Adobe Flash Player compatible allows for faster analysis of large data sets and interaction with the active report. For more information about active reports for Adobe Flash Player, see Active Technologies Report Integration With Adobe Flash Player. Sort data within any column in ascending or descending order. Apply calculations to columns and choose the location at which to display results. Control the display of data by hiding columns, freezing columns, limiting the number of rows per page, and using graphic visualization to compare column values. Create a variety of simple or advanced charts (pie, line, bar, or scatter) and Rollup Tables. Apply a global filter to multiple reports within the same HTML page. Export report data and chart data. Run active reports on your mobile device with the Opera™ browser (Version 8.60 U2 or higher) installed. See the Opera website for a list of supported devices. Run active reports on your iPhone® mobile device. For the best performance results, it is recommended that you set a maximum of 500 records for a mobile report. Some active report functionality is drag and drop based, and thus not supported with iPhone. The following image shows an HTML active report. 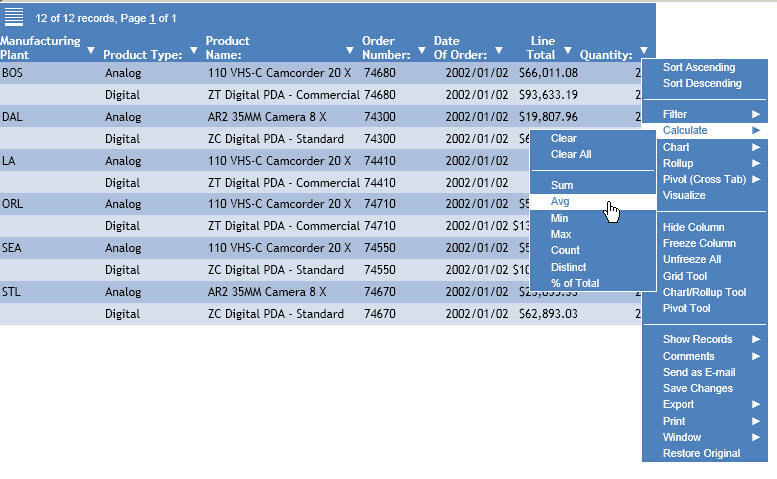 The pop-up menu is open for the Quantity column, with the Avg Calculate operator selected. You can password protect an active report. This feature restricts users from viewing the report by requiring them to enter a password before opening the report. The data is encrypted using the 256-bit Advanced Encryption Standard (AES) specification. The password is used as the key for decrypting and encrypting the data. Therefore, the password is not stored in the report, and you do not need a connection to go back to the server for password verification. Because all post-retrieval processing is performed in the memory of the web browser, an active report has a processing limit of approximately 5,000 records or 100 pages of output. The active cache option enables you to send only the first page of active report output to the browser and retrieve subsequent pages from a temporary cache on the WebFOCUS Reporting Server. The server also becomes the resource for performing all calculations, sorting, and filtering when active cache is enabled. Since active cache uses on-demand paging functionality, WebFOCUS Viewer is not supported. The active report with active cache option in the clustered server environment, using Cluster Manager (CLM), will maintain the connection with the WebFOCUS Reporting Server where the temporary cache is created in order to retrieve subsequent pages from the browser, while the report is in the same browser session. The active cache feature uses a POST instead of a GET in an HTTP request. If your applications run active cache reports that use WebFOCUS Web Services, see the WebFOCUS Web Services manual for more information.